Now is the time for costumes, trick-or-treaters, candy, parties, scary movies, jack-o-lanterns, zombies, and poltergeists. Not to mention an overload of sparkling vampires... What`s up with that anyway? Last time I checked, Count Dracula didn`t sparkle or go into the sun. Sure, candy is great. Actually, candy is quite delish. But here at Bacon Today, we`ve noticed that there seems to be quite the shortage of cool Halloween bacon stuff! We`re all huge fans of bacon, (duh), but little does everyone know that we also love Halloween. Halloween is dedicated to fun. Bacon is fun. Therefore they should go hand in hand. We`ve seen the ever so awesome Bacon Costume. But what else is there? Pretty sure someone of sheer genius will eventually create a s(e)xy bacon costume. Lady Gaga came close. But that`s beef, honey. 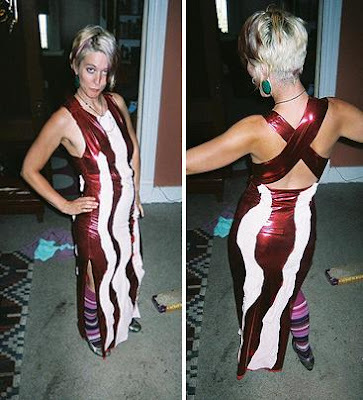 Go with pork next time and make it a bacon dress! We know you already agitated the vegetarians and vegans of the world, but no one could be mad with bacon, right? I mean, it`s BACON! So what about a Men`s version of the s(e)xy bacon costume? Well, I guess the Bacon Suit covers just that. It`s James Bond with a bacon twist, right? You have to admit that this suit is pretty epic. It takes some serious undying bacon love to pull off this one. Now that we covered the costumes, where`s the actual bacon? These costumes would be even sweeter if it was cooked bacon that you could eat off the wearer. Now, that`s s(e)xy and delicious. But alas, this is not the case. (Insert a long resonating sigh here.) But thanks to our wonderful, and ridiculously good-looking friends at Bacon Freak, we now have Halloween bacon! They have Frankenswine`s Hickory Smoked Bacon and Piggy the Vampire Slayer Bundle. For something with delicious candy, you can bring the Dentist`s Halloween Nightmare. With Gummy Bacon, Bacon Gumballs, Bacon Lollipops, and Bacon Chocolate. It`s all about the candy this Halloween, right? Well, the costumes too. But we know that some of you just want to wear a cool shirt. Especially if you`re taking the kids trick-or-treating. Get the cool Welcome to the Slaboratory shirt. Or in a sweatshirt! Choose your style and you don`t even need a costume! Thanks Bacon Freak for feeding and clothing us with bacon! So there you have it folks. Halloween bacon awesomeness! It`s going to be quite the delicious and fun Halloween. Now go get freaky!